Klassen, Julie. The Innkeeper of Ivy Hill: Tales From Ivy Hill- Book 1. Bloomington, MN: Bethany House Publishers. 2016. Due to her husband’s unexpected and sudden death, Jane Bell now finds herself thrust into the role of the Innkeeper of The Bell. With the former Innkeeper visiting, who just happens to also be her mother-in-law, Jane must not only learn the business but also manage her relationship with Thora. Struggling to make ends meet, Jane must decide who is safe to trust while also exploring new methods, safekeeping her business, and possibly her heart. 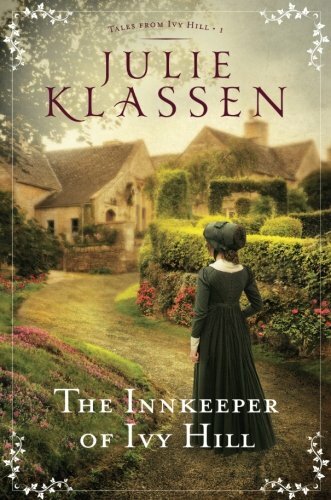 Due to the author, Julie Klassen ,I knew I wanted to read this new novel set in the English village of Ivy Hill. Filled with romance, mystery, relationships and hope, The Innkeeper of Ivy Hill may have started a bit slower than expected but picked up the pace half-way through it. As a longer novel, though it took a bit to develop the characters and intricately intertwined relationships, it was worth the investment to complete the book. Fully immersed in the lives of the members of this quaint community now, I look forward to reading the next in this series, The Ladies of Ivy Cottage, due out in December of 2017. This entry was posted in Christian Books and tagged Christian, Christian Author, Christian Book Review, Christian Fiction, Christian Historical, Christian Romance, England, Innkeeper, Ivy Hill, Julie Klassen, Tales from Ivy Hill Series, The Innkeeepr of Ivy Hill, The Ladies of Ivy Cottage by Savurbks. Bookmark the permalink. SOUNDS LIKE A GOOD READ!! !